Goda Masala, the name itself brings back memories of home made food for me. I remember my mother and grandmother adding Goda masala to all sabzis and daals on daily basis. This is a classic Maharashtrian spice mix used in almost every househould of Marathis. Use of this masala ranges from making Misal to the Bharli Vangi (Stuffed eggplant) and Chincha-gulachi amti. Bonus, you can also slather it over roti or slice of bread and eat it as a roll or sandwich. Gosh! Even writing makes me anxious to make another batch soon. 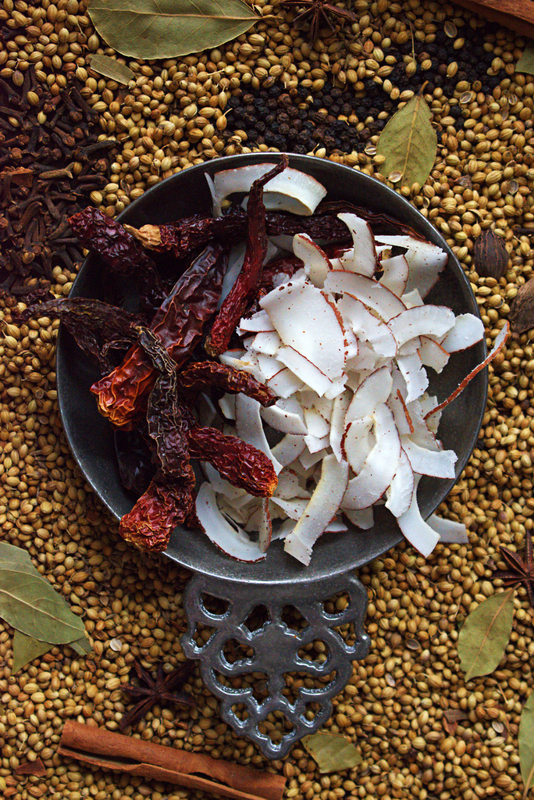 The first time I made this Goda masala, my kitchen was filled with the aroma of roasted spices. 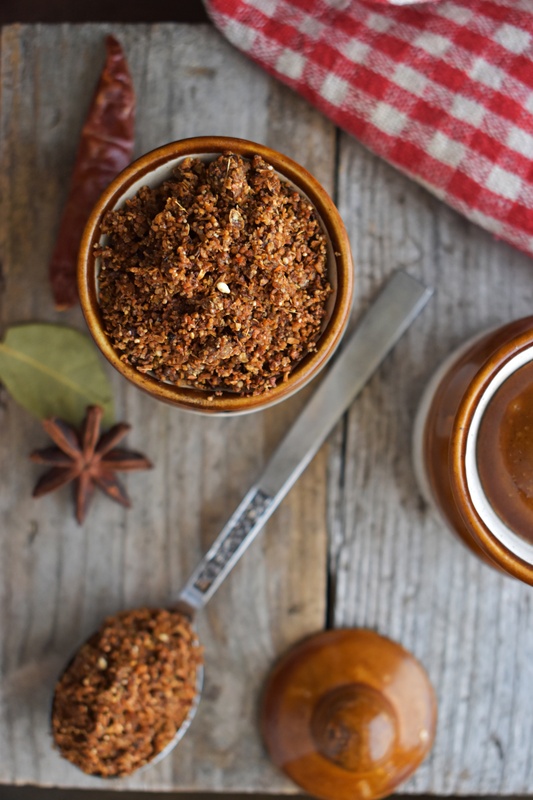 Goda Masala is basically dry spice mix made of all the essential Indian spices. These spices are roasted in little or no oil and then ground to a coarse powder. I can’t tell you enough of the waft of fragrances you encounter when roasting all the spices. 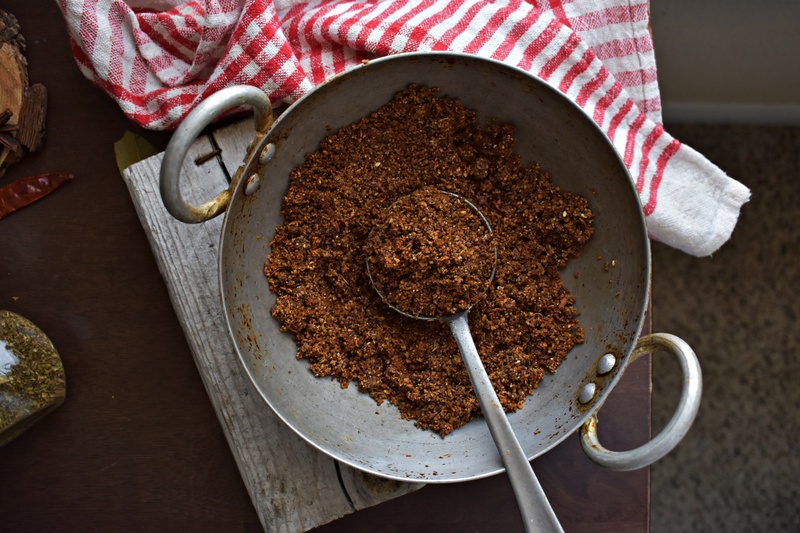 This Goda Masala has been a part of the Maharashrian cusine from a very long time. Although the way it is prepared changes from region to region. One major difference I see is of coconut. The one’s that are prepared in the coastal areas has fresh coconut and the ones in the central Maharashtrian region has more dry coconut and different measurements of the same ingredients. 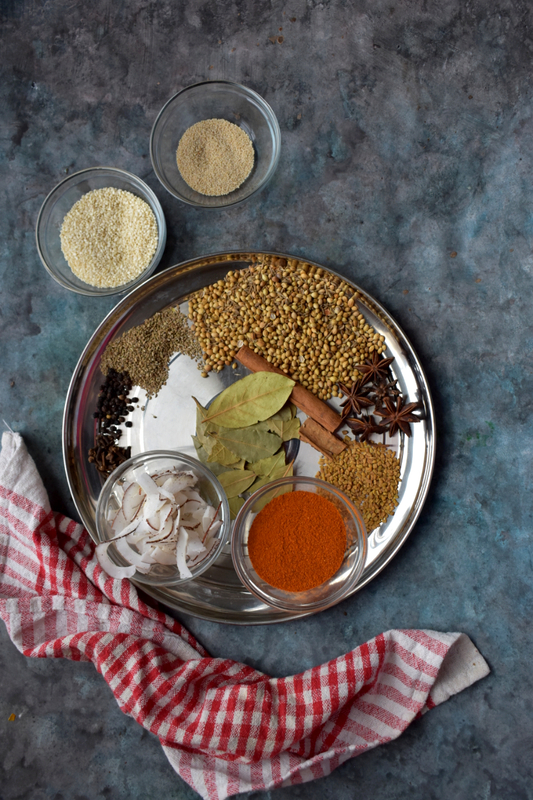 What is the difference between Garam masala and Goda masala? All this while you might be wondering if I am referring to Garam masala with another regional name, NO! Goda masala is different. Although Goda masala has all the ingredients like coriander seeds, peppercorns, cinnamon seeds, cumin seeds, cloves, star anise and turmeric. This masala also has dried coconut, sesame seeds, methi seeds and poppy seeds. All these ingredients when toasted impart a crisp and crumbly texture to the masala unlike the powder dry texture of Garam masala. And I bet you, the taste of food changes from 0 to 10 when this Goda masala is added. I usually add this masala into my regular daal tadka to impart a mellow taste of spice in daal. Where can I use this spice mix? This spice mix is usually used to make traditional Maharashtrian recipes like Masala bhaat, Bharli Vangi, Shev bhaaji, Daals, Palak bhaaji and Varan phala. You can also add this masala to the daily cooked veggies like potato stir fry and bhindi fry. 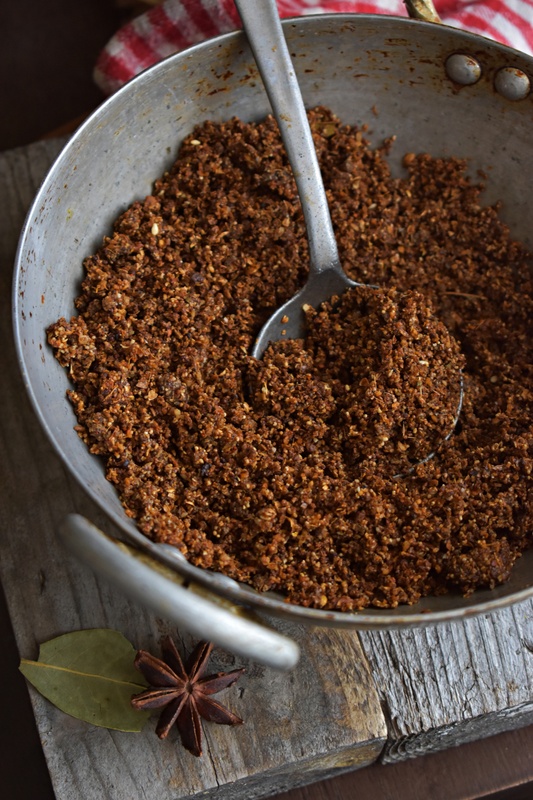 Goda masala, one of the classic Maharashtrian spice mix that has many of the uses, one of them including the famous Misal. In a medium sized saucepan, add coriander seeds and roast until they are slightly brown on medium flame. Transfer the coriander seeds to a plate and let it cool down. Then add bay leaves, cloves, cumin seeds, dagad phool and peppercorns and roast them until aromatic. Transfer once roasted to the same plate of coriander seeds. Then roast cinnamon sticks, star anise, carom seeds and fenugreek seeds. Once done, now add little oil to the pan and roast the grated dry coconut until golden brown. Transfer it to the plate and let it cool. Now add sesame seeds and roast until golden brown. Transfer when done to the plate. Then add poppy seeds and roast until golden brown and let it cool for some time. Roast dried red chilies for 1 min and transfer to cool. Once the spices have cooled down, transfer them to the grinder jar made for spices. To this add red chili powder and salt for taste and grind until fine powder. This powder is mostly crumbly because of sesame seeds and poppy seeds. Store this into an airtight container. This can be stored into the refrigerator for 3 weeks. You can either use Jeera or Shahjeera, the taste is perfectly fine. If you are making any of the Maharashtrian dishes, you can definitely opt for this masala to get more authentic taste of the dish.